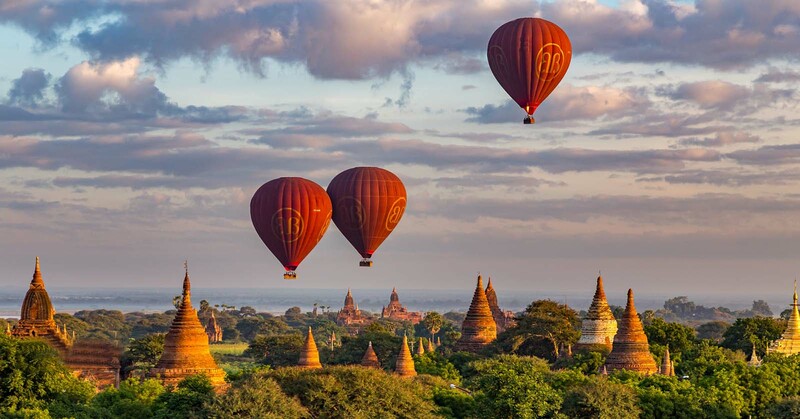 Enjoy a magnificent bird’s eye view of thousand year-old pagodas, temples and the mighty Ayeyarwaddy River with “BALLOONS OVER BAGAN”. Leisure time in the afternoon. Evening, excursion by boat on the Ayeyarwaddy River for sunset with cocktail and some snack. Visit the site of TAYOKEPYAY TEMPLE in Min Nan Thu Village, PHAYA THONE ZU and NANDAMANYA TEMPLES. Sightseeing continues with an excursion by boat on the Ayeyarwaddy River to the nostalgic NAT HTAUNG KYAUNG. Drive to Salay, 15km far from Bagan, down the Ayarwaddy River. Visit U Pone Nya Museum, Tha-ta-na Kyaung. Afternoon, journey to Mount.Popa for sightseeing. Return to Bagan. After breakfast, transfer to Nyaung U airport for domestic flight back to Yangon. If have enought time, we will visit some famous place in the city: Lawka Chanthar Arbayar Laba Muni Buddha Image (Kyauktawgyi), Royal White Elephant camp, Kaba Aye Pagoda and Maha Pasana Cave. Arrive at Yangon International Airport. We welcome and transfer you to hotel. After a refreshment, we star the tour in Yangoon. 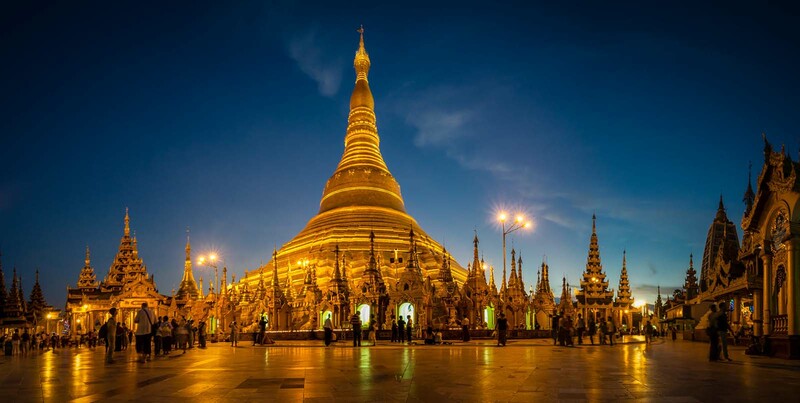 The tour sightseeing includes visit the old colonial-style city center with the gilded SULE PAGODA, strand road and Yangon Jetty by Car. And visit Bogyoke Aung San (Scott) Market, is the most popular market (close on every Monday & Public holiday) and where you can buy luxury item, handicrafts, food stuff, clothing, jewelry, fashion and consumer goods. Afternoon, continue to Chaukhtatgyi (Reclining Buddha) Pagoda a colossal reclining Buddha, Karaweik Hall Royal barge on the Royal lake for photo stop and world famous Shwedagon Pagoda. Witness the golden dome light up sunshine at the sunset. Overnight at Yangon. Breakfast at hotel, early morning transfer to the airport to take domestic flight to Bagan. Arrive at Bagan and transfer to hotel. After a refreshment, sightseeing to the one of Asia’s most popular archeological destination. We will visit colorful Naung U Market and visit some of Bagan most famous pagodas,including Shwezigon Pagoda,a prototype of later Myanmar stupas: Gupaukgyi ,a 13th century cave temple with interesting fine frescoes of scences from the jatakas and Anada Pagoda,one of the visit to a Lacquerware factory.We will also visit Dhammayangyi Patho, a massive later period temple with the finest brickwork in Bagan.As the sun goes down we will be at one of the ideal viewing sites selected by our tour guide. Early morning, the tour start for surprise discover day to see the ancient city of Bagan form above. We enjoy a magnificent bird’s eye view of thousand year-old pagodas, temples and the mighty Ayeyarwaddy River with “BALLOONS OVER BAGAN’. It is a very exiting experience and clients will never forget. The Balloon is guided by gentle wind and chance to see slowly the sun rising. The balloon is guided by gentle winds and operates form 20 Oct 2013 till 20 Mar 2014 only. Afternoon, return to hotel for free and leisure time. Evening, excursion by boat on the Ayeyarwaddy River for sunset with cocktail and some snack. After breakfast, visit the site of TAYOKEPYAY TEMPLE in Min Nan Thu Village, PHAYA THONE ZU and NANDAMANYA TEMPLES noted for exquisite murals of 13th century and KYAT KAN CAVE monastery, a famous meditation center in Bagan. Visit farming villages around Bagan. Sightseeing continues with an excursion by boat on the Ayeyarwaddy River to the nostalgic NAT HTAUNG KYAUNG, a wooden monastery built in 1781 by a group of monks, famous for woodcarvings, a collection of ancient Buddha statues and lacquer boxes. After breakfast, drive to Salay, it is a small town about 15 km south of Bagan, down the Ayarwaddy River. U Pone Nya Museum, formerly the Yoke Sone Monastery, exhibits antique lacquer wares, wooden relieves and a large standing gilded Buddha image. The figures carved outside the front of the building are worth seeing. Another place worth visiting is Tha-ta-na Kyaung (Keythar monastery) where Tipitaka texts are housed in a large red lacquered cabinet. Afternoon, proceed on a scenic overland journey to Mount.Popa, an extinct volcano which 1518 meters (4981 feet) above sea level, and a day trip from Bagan, set mid lovely hill and forest scenery. The Popa Taungkalat Shrine is home to 37 Mahagiri Nats, or spirits, Satues depicting the Nats are at the base of the shrine. From the top of Taung Kalat, one can enjoy a panoramic view of the ancient city of Bagan. Late afternoon, return to Bagan. After breakfast, transfer to Nyaung U airport for domestic flight back to Yangon. Arrival at Yangon, if time permit, visit to Lawka Chanthar Arbayar Laba Muni Buddha Image (Kyauktawgyi) and Royal White Elephant camp and Kaba Aye Pagoda and Maha Pasana Cave.